This Peaches and Cream Cake was inspired by my new cake stand. Yep, that’s how my brain worked on this one. Peaches and Cream came to mind and a star was born! Not to mention it is full on peach season right now too so what better idea than this? 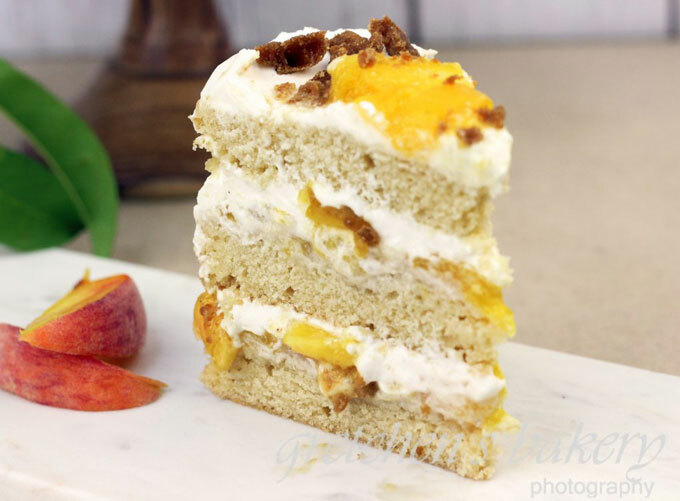 My best recipe for vanilla cake takes center stage once again and to compliment those perfect moist layers is a fresh peach filling and billowy vegan whipped cream! A glorious addition of my old obsession “cake crunch streusel” makes a crunchy texture amidst all those clouds of vanilla and peaches. 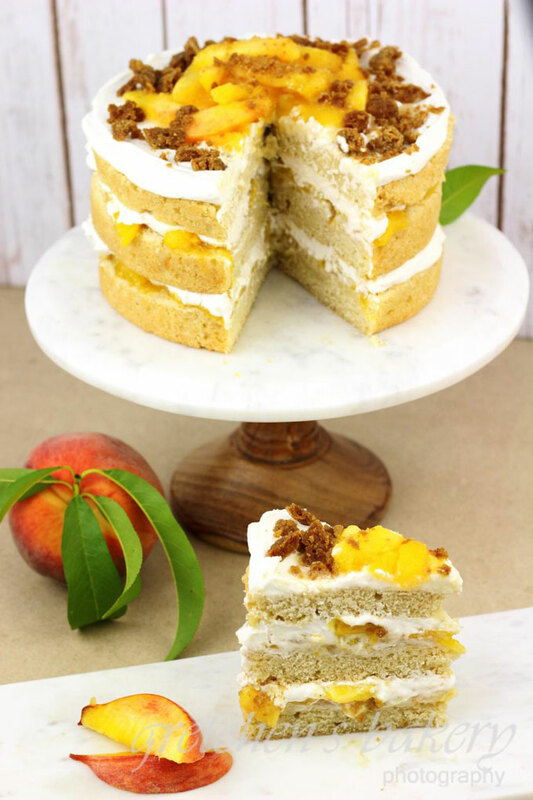 The Vegan Peaches and Cream Cake is the sure winner this summer! A note about the whipped cream I am making here. I used (a slightly adjusted) Miyoko Schinner’s recipe as listed below where I increased the coconut oil from her base recipe. I though it was “okay” but not very stable for icing cakes, I think her recipe was intended as the whipped cream portion for chocolate mousse, which I could see how great it could work there. I have since made it without the cashews, but increased the coconut oil even more and added ¼ teaspoon xanthan gum. I also used alot less sugar than her recipe calls for, and I do prefer my altered recipe for sure. It is more stable, whips smoother and I didn’t have to use the cashews (so this cake remains nut free) and the xanthan really keeps it nice and thick like you remember heavy cream to be! A note about the whipped cream I am making here. I used (a slightly adjusted) Miyoko Schinner's recipe as listed below. And while I included the cashews in the video as well as the ingredients listed below, I have since made it without the cashews, but increased the coconut oil and added ¼ teaspoon xanthan gum. I do prefer my altered recipe as it is more stable, I didn't have to use the cashews ( so this cake remains nut free) and the xanthan really keeps it nice and thick like you remember heavy cream to be! First prepare the whipping cream by combining all of the ingredients listed: the milk, coconut oil, vanilla, sugar and cashews together in a high speed blender and blend until perfectly smooth and there are no traces of nuts. Transfer the liquid to a mixer bowl and refrigerate until ice cold (several hours) I find this whips best when it is as cold as possible and I have sped the process by freezing, just be careful not to freeze solid or you will have to wait until it thaws to whip. Meanwhile, prepare the cake batter by first adding the vinegar to the soy milk to sour and combine the flax meal with the hot water to thicken. Next prepare the Cake Crunch Streusel *optional step - by combing the flour, brown sugar, cinnamon and nutmeg in a mixing bowl then add the cold diced vegan butter and mix just until it resembles coarse meal. Transfer to a sheet pan lined with parchment paper and freeze it while you pre heat the oven. Next prepare the peach filling by peeling and slicing the peaches into a large bowl. Add the cornstarch, nutmeg, cinnamon, orange juice and agave and toss to coat evenly. Transfer the peach mixture to a medium sauce pot and cook over medium heat for about 5 minutes, the juice will start to bubble and thicken slightly. Once you are ready to build the cake - Whip the ice cold whipping mixture with a balloon whip attachment for about 5 minutes on medium high speed, until soft peaks form. It will look a little like mayonnaise. Be careful not to over whip or it will get grainy. 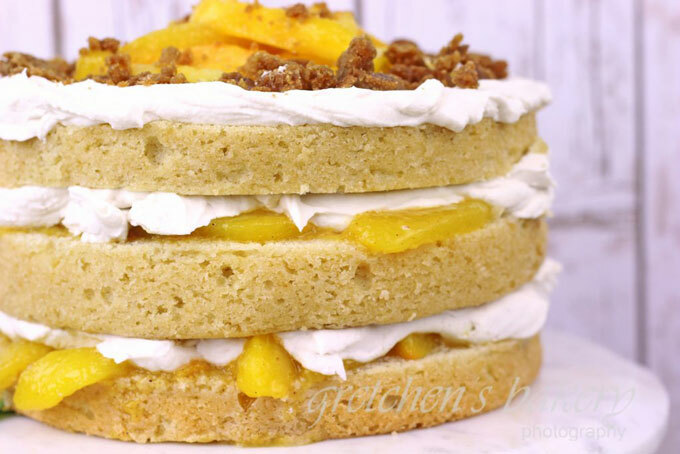 This looks amazing Gretchen, especially because of the new vegan whipped cream recipe <3. How would omitting the xanthan gum affect the recipe and was the cream u used in the video the cashew nut or this version? Could almond milk work for the whipped cream? This looks amazing! I just bought your cookbook, and I’m looking forward to trying some recipes, but I can’t buy Ener-g where I live. Can I sub tapioca starch or corn starch, or anything else? Do you think using an emulsifier (soy lecithin) would help with the whipped cream? Extra stability possibly? You can add that for sure! about a teaspoon. I did not find it needed extra stability though since this whipped cream will stay really stiff in the fridge for days! I had this cake in my fridge for a week and it did not lose any integrity! Dear Gretchen, do you have any idea what might have gone wrong with my whipped cream without cashews? It just won’t form stiff peaks after being chilled in the fridge overnight. I carefully measured all the ingredients. I am trying to freeze it a bit now and try to whip it again. Thank you! Good idea to freeze it a bit – I will do that sometimes too if it seems to be taking forever to whip! Can I substitute the soy milk for coconut milk in your recipe. This cake looks perfect on your new cake stand! Looks amazingly yummy. 🙂 Lol yep!! haha Thanks Chelsea! i live in UK where can i get flax meal? Gretchen could I use gf flour? CLICK HERE for my friend Deborah who has GREAT recipes! 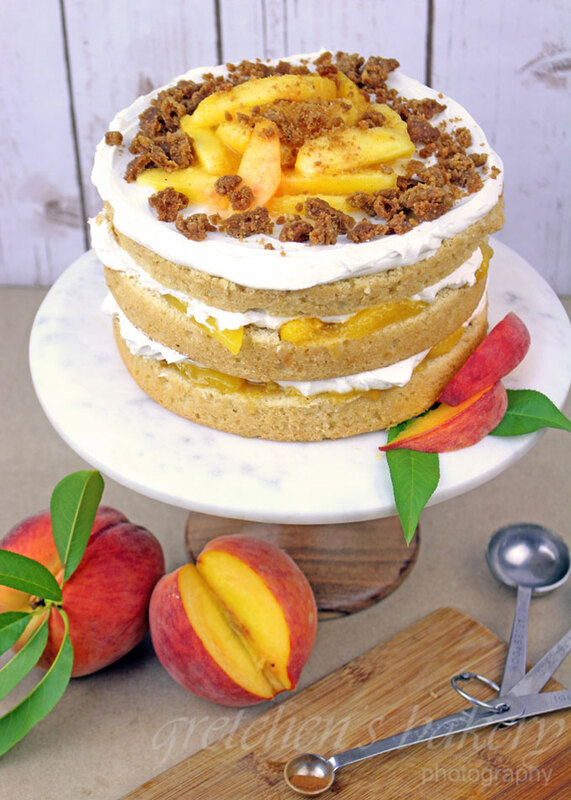 What type of flour do you recommend using for this peach cake recipe? Regular All purpose flour, Self rising flour or Cake flour? Thank you! Can i use “Cream of Tartar” instead of Xantham Gum for the Whipped Cream with NO cashews? Will it still give me the same solidity as the xantham gum would? cream of tartar is an acid, that would typically work as a stabilizer in a meringue, but It won’t do very much here. The xanthan gum is a thickener that helps to stabilize emulsions, so they are no synonymous. If i use two 6 by 2 inch cake pans for this recipe what would be the bake time and temp?